You made it! We made it! 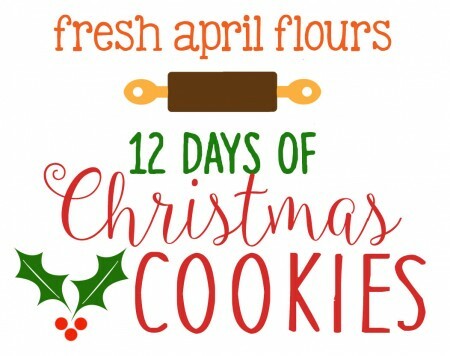 Everyone made it through 12 days of Christmas Cookies! How did we do? Did you make any of them? All of them? Is your cookie jar full of fresh cookies or just crumbs from pure enjoyment? How much butter did you go through in the past 4 weeks? Oy vey, I need to buy some stock in Land-O-Lakes, I think. So this cookie… I meant to bring it to you earlier, but that just didn’t happen. There are a few reasons. 1) despite the fact that I made these cookies and photographed them the first weekend in October, there are a bajillion pictures and editing them took some time. 2) This cookie is the most near and dear to my heart cookie ever, and I have a lot to say about it, so I’ve been trying to keep my words to a minimum (but let’s be serious– you know me!). 3) And lastly, this recipe makes a ton of cookies. And I wanted to bring you a recipe that was maybe a third of the size of the original recipe, but when I tried to cut it down, I ruined it. Terribly. Like… So terribly. So you’re stuck with the huge recipe, but that’s ok, because the cookies save very well! So let’s start from the beginning… This cookie has been in my dad’s family since before he was born. 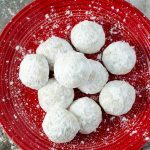 This traditional Italian cookie was brought to America by my paternal great grandmother from Italy, taught to my paternal grandmother (the Eva behind this and this), and then my dad taught himself how to make them because there was never a recipe written down from those original Italian ladies (shocker). But let’s back up a bit. This cookie actually has Jewish origins. In the 1600s the Jewish people throughout Italy, and most especially Rome, were forced from their homes by the ruthless Medici ruling family. Many settled in Pitigliano, a small mountain town in west central Italy. They thrived there, building a synagogue as well as bakeries so they could enjoy their favorite breads and other baked delicacies from their culture. 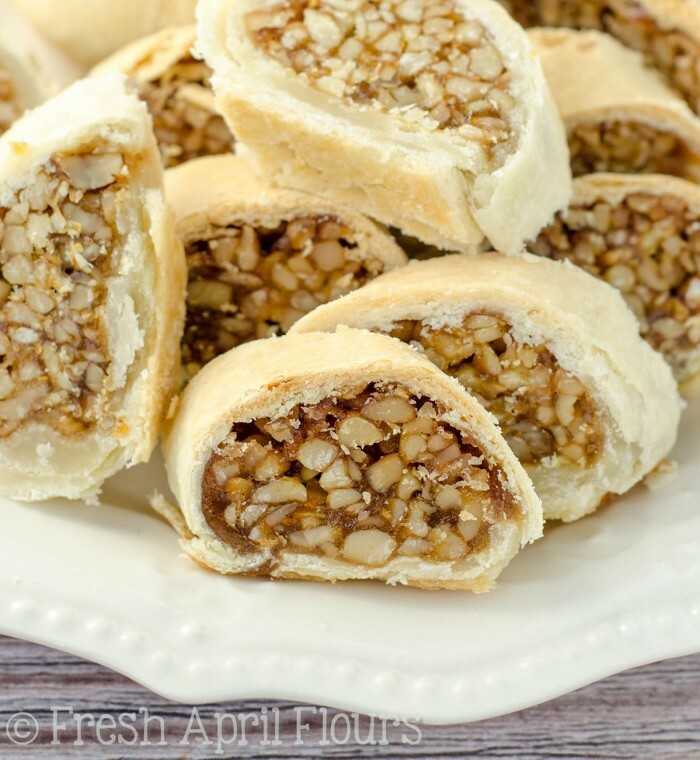 One of the delicacies that emerged from this time was sfratti, simple stick shaped pastries filled with walnuts, cinnamon, honey, and orange peel, which, according to some, commemorate the removal of the Jews from their homes to a more urban area established to contain them. Sfratti is the plural of the Italian word sfratto which means “eviction.” According to the story of the expulsion from their homes, the authorities would come and knock on the doors of Jewish families with a wooden staff, and further brutally use the staff to force the residents from their homes. The stick shaped pastry symbolizes the forced expulsion and beatings the Jews suffered as they were forced from their homes. 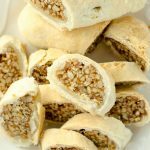 Over time, sfratti became a favorite of non-Jews as well, and sfratti are now a staple of the Italian Christmas. 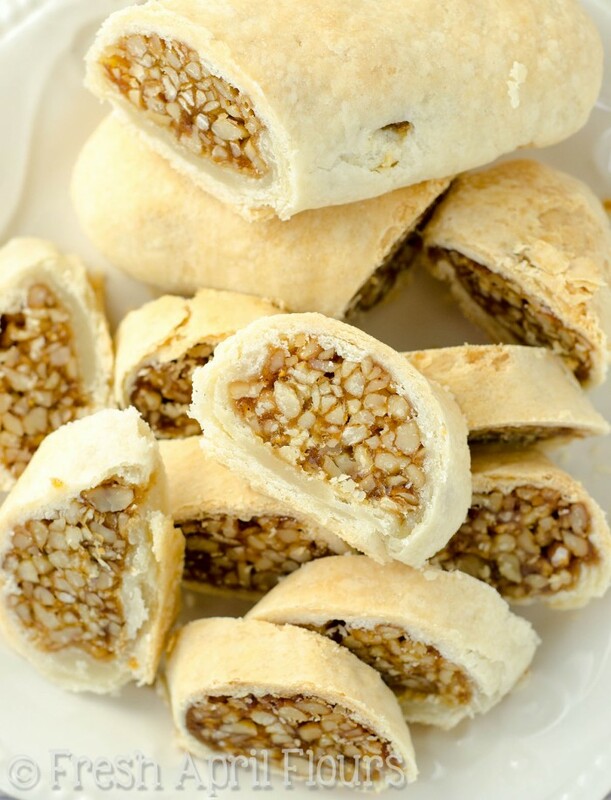 So there you have it: honey walnut cookie sticks (aka sfratti) that come from Jews in Italy. How diverse! Now, these cookies are slightly complicated. 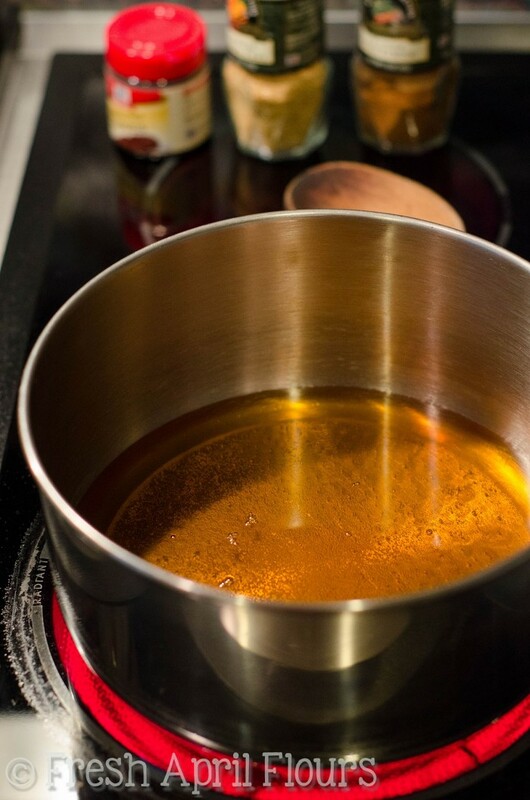 They start with boiling honey, which is pretty much boiling sugar which is the same as making candy. This can go incredibly wrong if it’s done improperly, and I think that’s where I lost it when I tried to cut the recipe down. 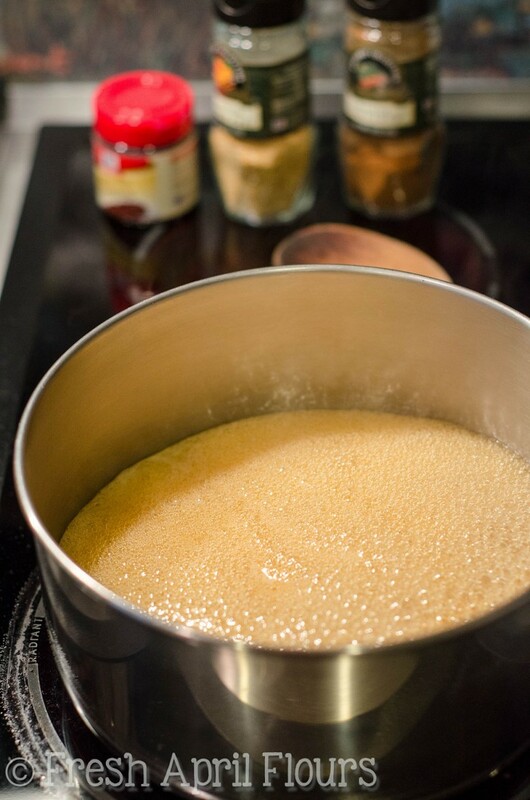 Boiling sugar can be dangerous and scary, and it’s also very specific as far as amounts and temperatures. So cutting the recipe down totally screwed up the times and temperatures that my dad had made for his recipe, which makes so many because he likes to distribute this cookie to all of his kids during Christmas. He has 4 kids (including me– I have 3 half siblings) and we all LOVE this stuff. One of my sisters cannot be trusted around her sfratti. She will devour it all the second she gets it. Seriously. So if you’re up for the challenge, I’ve got a ton of pictures and instructions below the recipe. The same words are in the recipe, but the pictures will help guide you along. 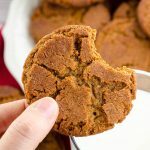 I’ll refrain from putting much more in here for fear of making this the longest post ever, but I will tell you what… These cookies are quite possibly my favorite cookie in the world. 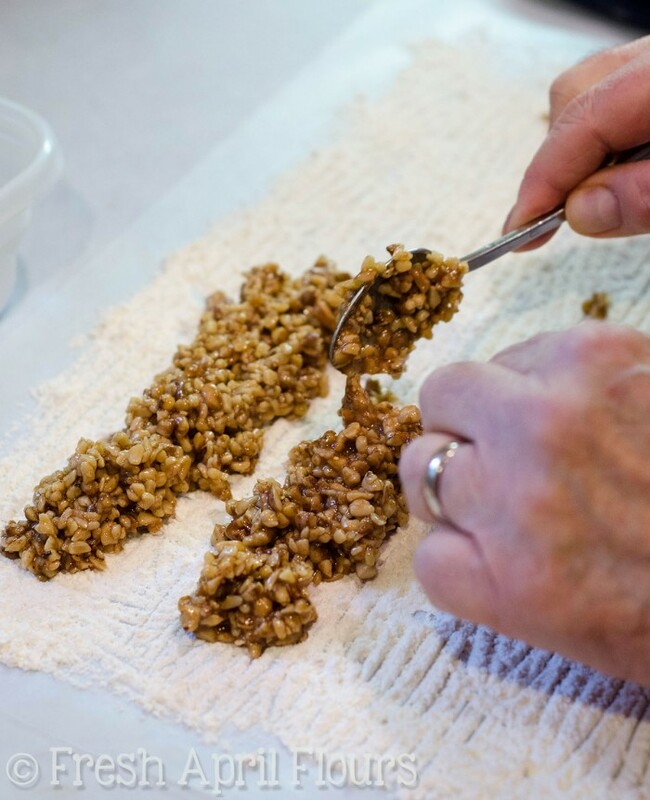 Aside from chewy oatmeal raisin cookies, which you can find just about anywhere, sfratti is almost a “delicacy” in the DeAngelis family and is special to all of us for so many reasons. Before you scroll down to the goods, let me just tell you that this cookie is unlike any other cookie you’ve ever had or made. 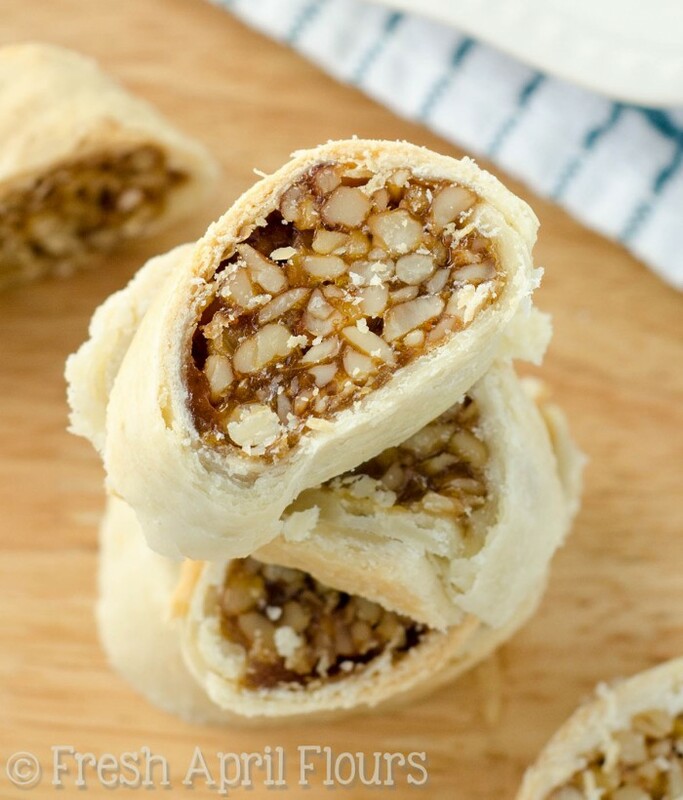 Although it starts out a bit like baklava, the nuts on the inside of the cookie sticks are much harder and crunchier, so it’s less of a “sticky” nut mixture. The pie crust also adds to the crunch, so this cookie is perfect for dipping into coffee. In fact, I think eating your sfratti with coffee is a must. 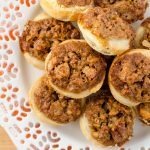 Crunchy walnuts sweetened with honey, spiced with warm cinnamon and cloves and jazzed up with orange zest (remember my orange zest in my pecan pie tarts?) all wrapped up in a flaky buttery crust? This cookie is a must in my Christmas cookie lineup, and I’d like to give a big shoutout to my dad for taking me under his wing one Saturday and showing me the ropes. Passed down recipes are the best kind, and I hope to become a sfratti pro so these cookies will last forever in the DeAngelis/April family. Make the pie crust (or be sure your frozen store bought is completely thawed). 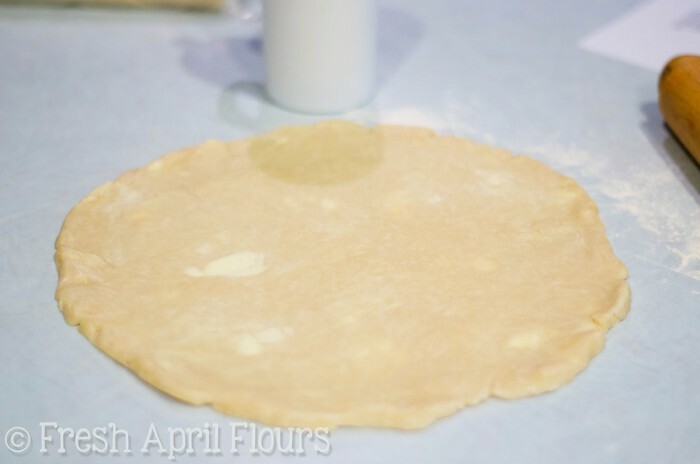 On a lightly floured surface, roll out one portion of the dough at a time into a 12" circles. Transfer to large baking sheets or large platters/plates and chill in refrigerator until ready to use. You will need 3 large 12" circles. Preheat oven to 350ºF. Line a large baking sheet with parchment paper or a silicone baking mat. Set aside. 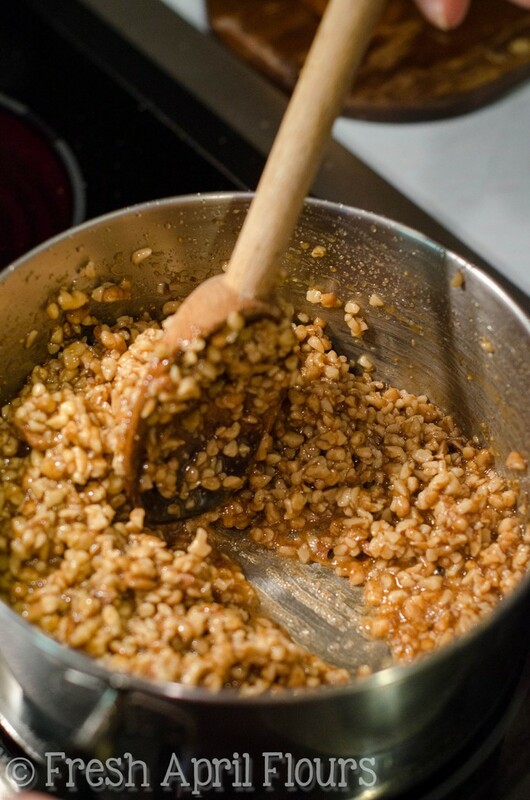 In a medium size bowl, toss together the nuts, orange zest, cinnamon, and cloves. Set aside. 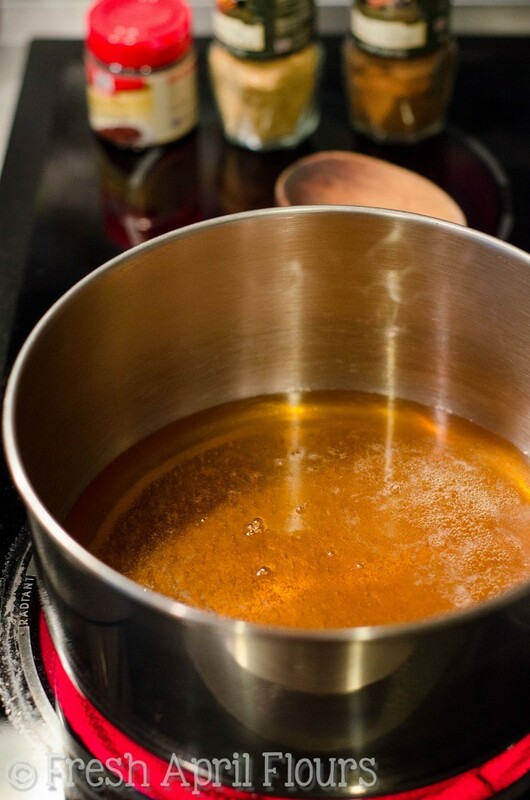 In a medium saucepan over medium-low heat, bring the honey to a boil. Be careful as it will foam up. When the honey starts foaming, set a timer for 5 minutes and allow to cook while stirring constantly with a wooden spoon or rubber spatula. When the 5 minutes are up, add the nut and spice mixture, set the timer for another 5 minutes, and stir constantly. 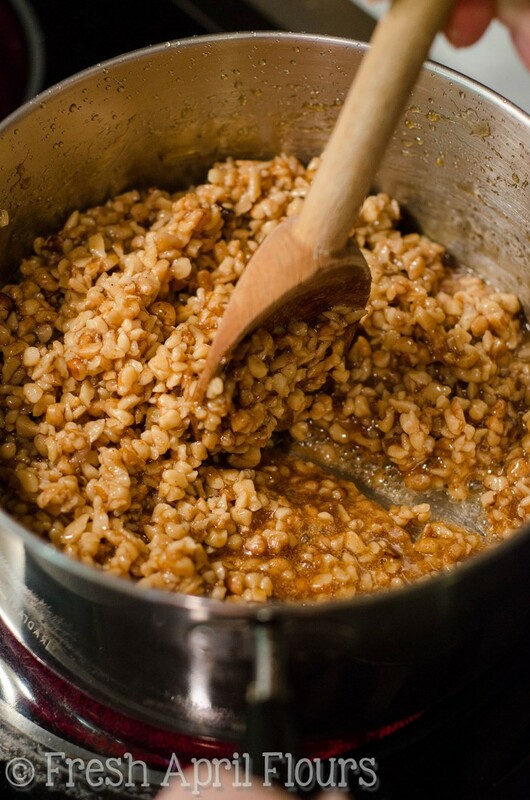 It probably won't take 5 minutes to cook, but you will know the honey/nut mixture is done when the honey no longer liquefies onto the bottom of the saucepan when you make a line through the mixture with your wooden spoon. Remove from the heat and let mixture stand, stirring occasionally until the mixture is cool enough to handle, but not set. 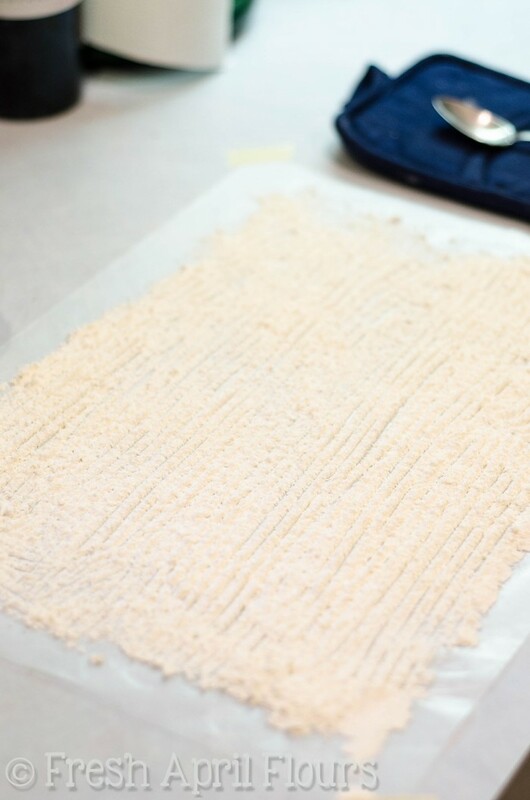 While mixture is cooling, spread flour into a large rectangle on a large piece of parchment or wax paper. My rectangle is typically 12" by 10". 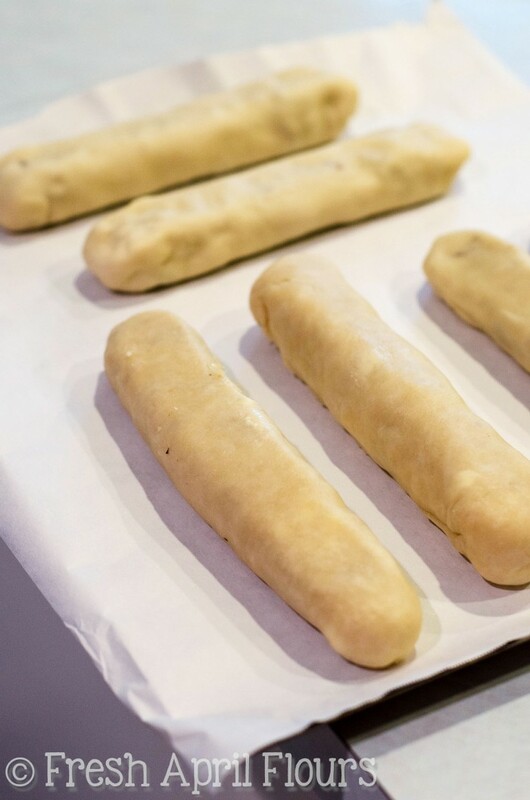 Using two spoons, divide mixture into six roughly shaped sticks on the flour approximately 6" long. Allow logs to cool a bit so you are able to touch them with your fingers. Smooth out the edges so the logs aren't jagged or uneven. Remove the prepared crust from the refrigerator. 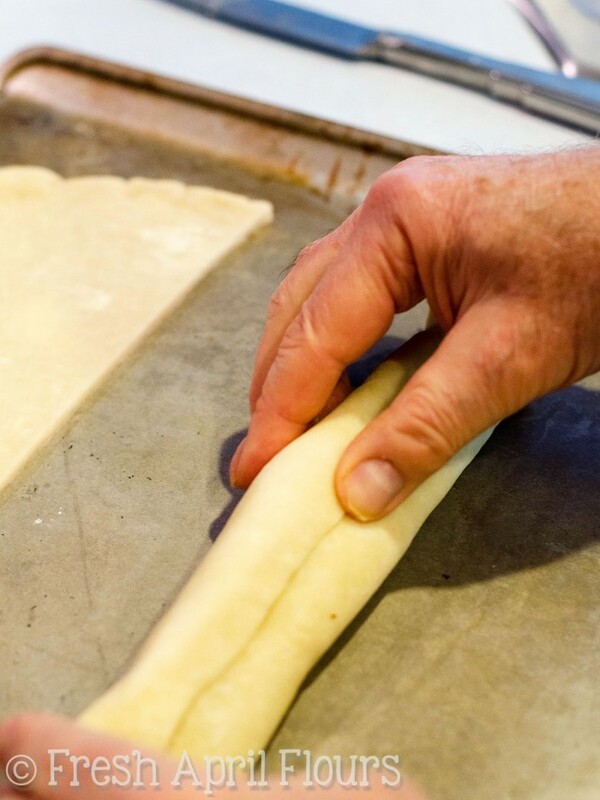 Working with one pie crust at a time, cut the dough circle in half with a knife. Working with one stick and one half of each crust at a time, place the formed nut stick on the short/curved edge of the crust. 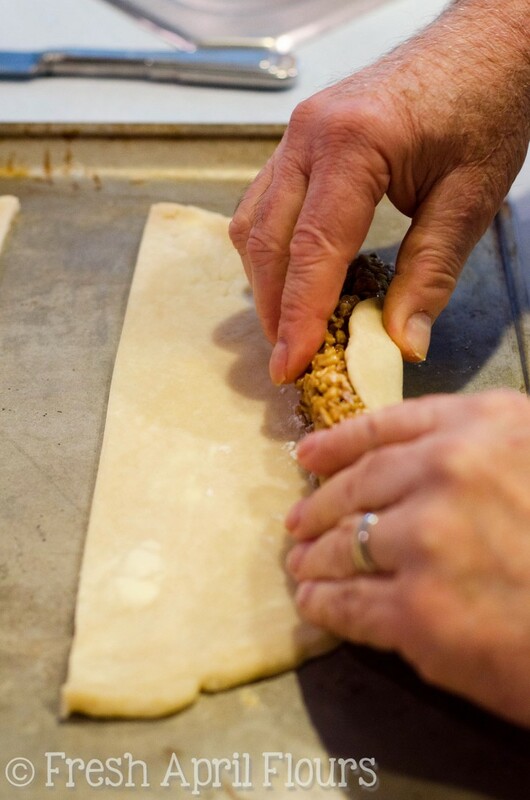 Roll the nut stick up in the crust until you reach the long/straight edge of the crust. 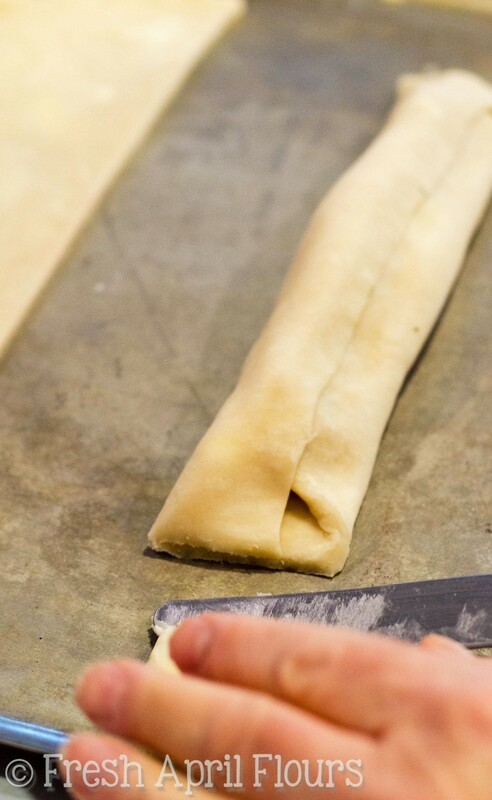 Cut off the excess crust on the edges of the roll, leaving about 1/2" to 3/4" to seal the roll. Fold the trimmed edge over each side of the log and press the bottoms and sides closed firmly with your fingers. Repeat with rest of the filling logs and crust. Place each finished stick on the baking sheet. If you would like to, brush an egg wash over the top of each stick. Bake until golden, about 30 minutes. Transfer to a wire rack to cool completely. Cut into slices before serving. Unsliced sticks will stay fresh wrapped in foil or plastic wrap at room temperature up to one week. 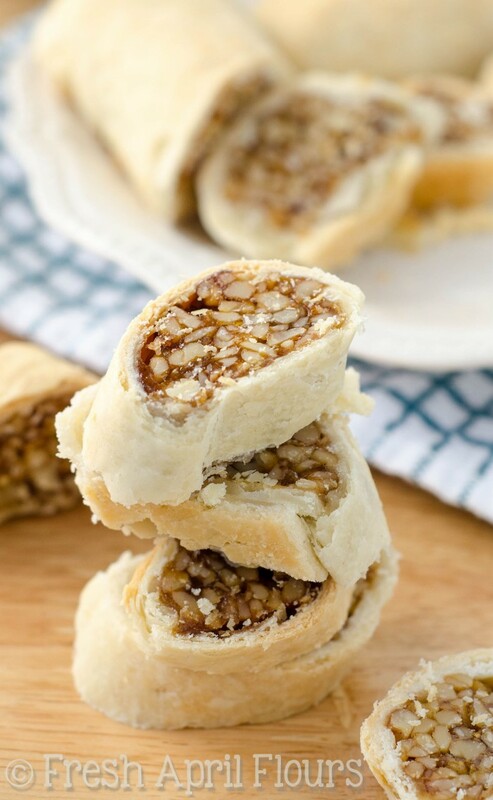 Sliced cookies will stay fresh in an airtight container at room temperature up to one week. Unsliced sticks freeze well, up to 2 months. Thaw in refrigerator overnight. Sliced cookies freeze well, up to 2 months. Thaw in refrigerator overnight. *I buy the nuts labeled "finely chopped" because I find I can't get the nuts small enough chopping them by hand, but they are too fine if I chop them with my nut chopper. Make the pie crust (or be sure your frozen store bought is completely thawed). 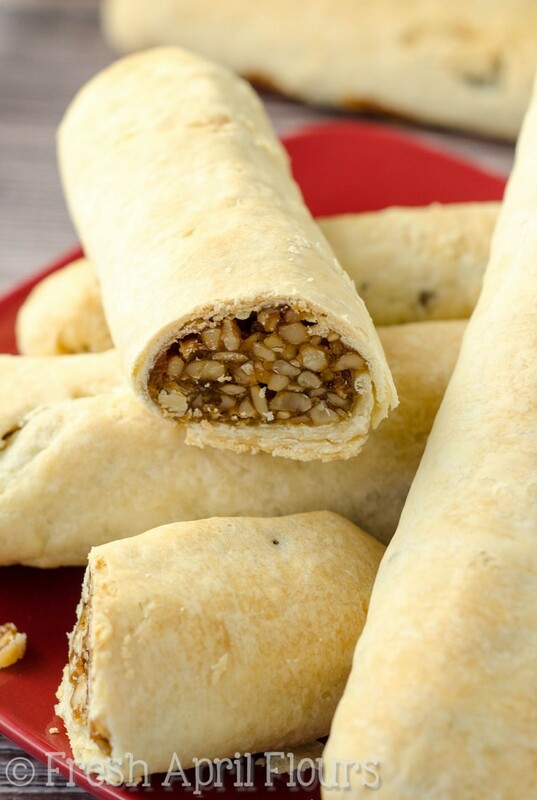 On a lightly floured surface, roll out one portion of the dough at a time into a 12″ circles. Transfer to large baking sheets or large platters/plates and chill in refrigerator until ready to use. You will need 3 large 12″ circles. When the 5 minutes are up, add the nut and spice mixture, set the timer for another 5 minutes, and stir constantly. 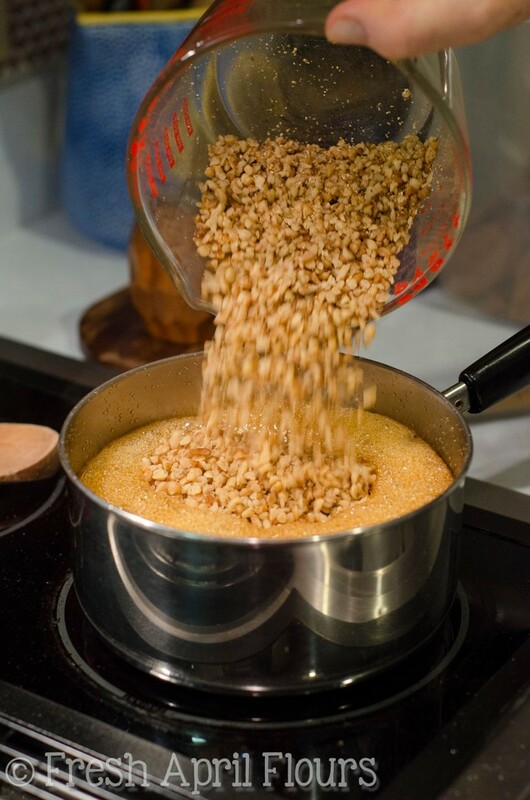 It probably won’t take 5 minutes to cook, but you will know the honey/nut mixture is done when the honey no longer liquefies onto the bottom of the saucepan when you make a line through the mixture with your wooden spoon. Not quite there yet… ???? Remove from the heat and let mixture stand, stirring occasionally until the mixture is cool enough to handle, but not set. 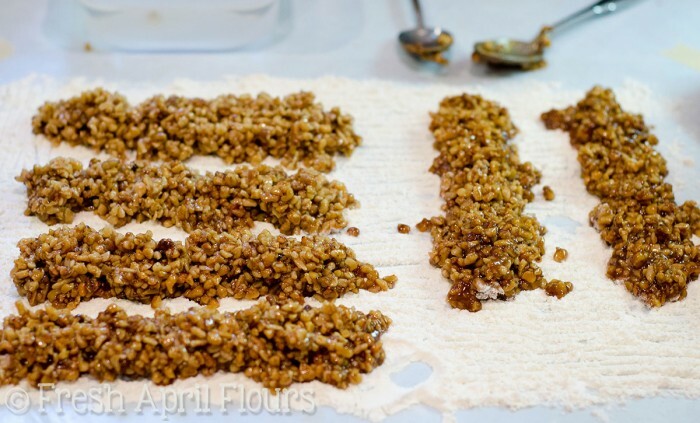 While mixture is cooling, spread flour into a large rectangle on a large piece of parchment or wax paper. My rectangle is typically 12″ by 10″. 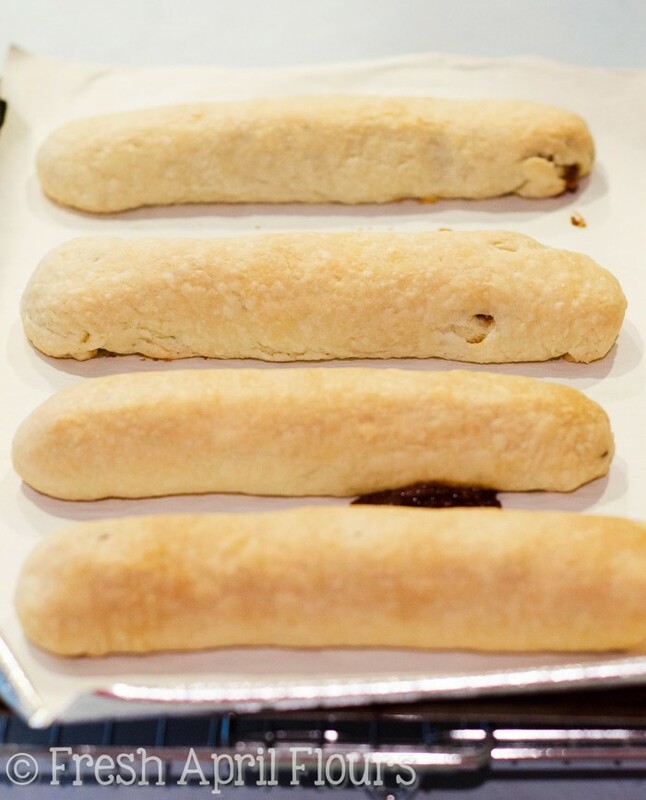 Using two spoons, divide mixture into six roughly shaped sticks on the flour approximately 6″ long. Allow logs to cool a bit so you are able to touch them with your fingers. Smooth out the edges so the logs aren’t jagged or uneven. Remove the prepared crust from the refrigerator. 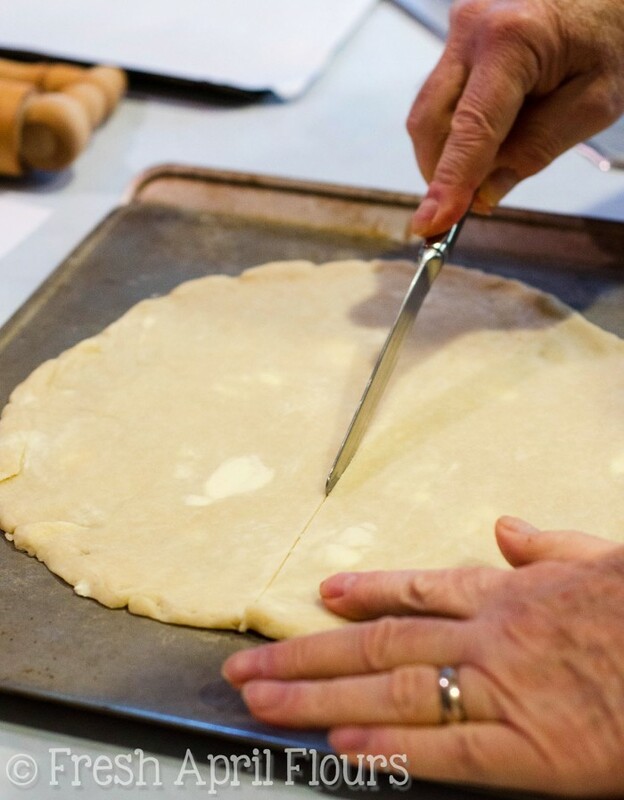 Working with one pie crust at a time, cut the dough circle in half with a knife. Working with one stick and one half of each crust at a time, place the formed nut stick on the short/curved edge of the crust. 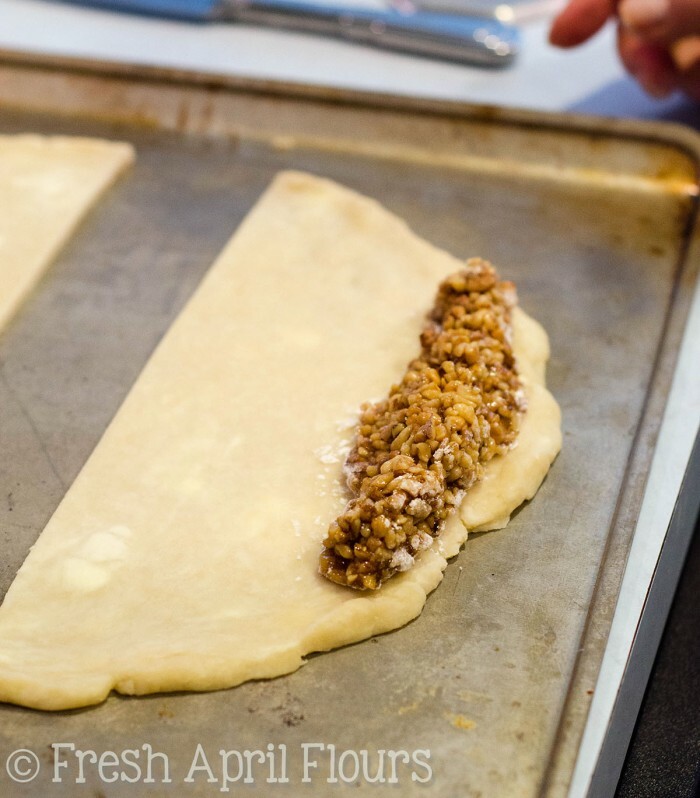 Roll the nut stick up in the crust until you reach the long/straight edge of the crust. Cut off the excess crust on the edges of the roll, leaving about 1/2″ to 3/4″ to seal the roll. Fold the trimmed edge over each side of the log and press the bottoms and sides closed firmly with your fingers. Repeat with rest of the filling logs and crust. Place each finished stick on the baking sheet. If you would like to, brush an egg wash over the top of each stick. Bake until golden, about 30 minutes. Transfer to a wire rack to cool completely. Cut into slices before serving. Ugh, LEAH. I tried so hard to cut the recipe down, but it’s just not meant to be. I may have to try again another time and adjust my times and such. 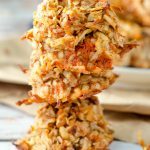 My suggestion if you’d like to make this recipe: make 2 sticks GF and then the others, use store bought gluten FULL pie crusts (or, make your own?!). That way it’s not too laborious or expensive! This is so cool! I love recipes that are passed down through generations! My grandma is Ukrainian so she has taught me how to make some traditional Ukrainian food (like perogies!). The history of them is also very interesting! Oh my word, these look so delicious, Lynn! What a fascinating history – I love learning about the background of such things. 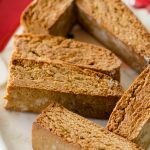 We have a colonial gingerbread recipe with a story behind it from the war of 1812. Very cool. I made your lemon cookies on Saturday and everyone devoured them! Seriously addicted. I think the history makes them taste better and the labor of love more worth it! So glad everyone loved the lemon cookies. I made my third batch today! Aww family recipes are always extra special! Thank you for sharing with us! And thanks for taking all those step by step photos – so thoughtful. These cookies really do look like works of art – amazing. I just made these. However, I used Pecans instead. Only cause I don’t like Walnuts. How thick do you roll the crust, they look so yummy can’t wait to make! Hi Terri– I roll it fairly thin, about 1/4″ thickness. 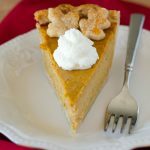 If using pre-made crust, this is easy, and you don’t have to roll it out at all. If you’re using your own, go for the 1/4″. Hi Liz– I’m sorry to hear this didn’t work out! If it looks and smells burned then it probably is, but if you say it’s runnier, that also makes me wonder if it’s not cooked enough. I would try with a lower temp on the stove next time and really make sure your honey is JUST done liquefying. These were a big hit this year, but I wasn’t happy with the crust. It flaked off very easily. I very rarely make recipes with pie crust, so I’m not sure what I did wrong. Hi there– I don’t think you did anything wrong. The crust is definitely very flaky! My dad has a little less flaking using store-bought crusts, but it’s definitely a normal characteristic of the cookie. How many cup,s in 12oz,s? I weigh all of the nuts I use, and 12 ounces of honey is 1 and 1/2 cups. I just got done making these,s they came out GREAT love you pie crust recipe I will be using it for my pie,s. So you used 3/4 of a cup of nuts,I bought 12 oz of honey is that right? I think I use to many nuts there was no flavor, they did look great though. I saw someone’s question about the honey. 12 ounces is a cup and a half. However, your answer to her was 3/4 cup. I bought a 12 ounce bottle of honey and planned to use the whole thing, according to your recipe. Will that be too much honey? That was my mistake on the previous comment. I have now edited it and changed it. I don’t ever measure my honey in a measuring cup, so 12 ounces will be the right amount. Thanks so much for your quick response! I can’t wait to make these. They remind my husband of his mother’s honey walnut cookies, which he’s never been able to duplicate. Until now! Thank a lot for the lovely recipe. I made it, and came out very well. Hi. I was wondering if the nut “logs” could be laid out on a piece of parchment to cool instead of on flour? I’m not sure– I’ve never tried it any other way! This was the way my grandmother always did it, and I never questioned it, haha. I think the flour insures the logs don’t stick, because they are VERY sticky. These look fabulous! 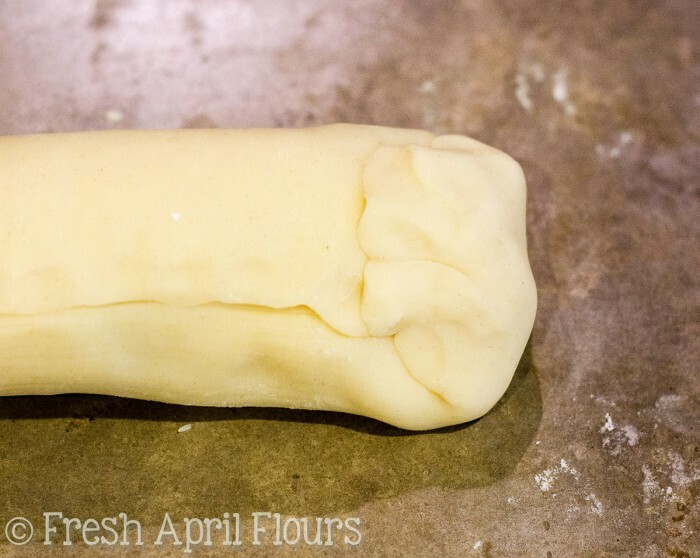 Could fillo dough be substituted for the pie crust? I’ve never tried that! 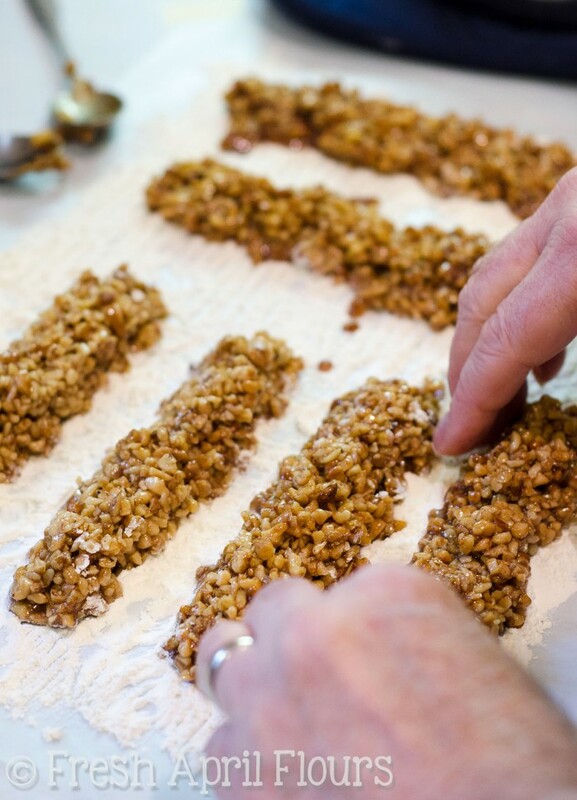 I think it would be pretty messy, though, since cutting through the nut filling crumbles the crust a bit already. If you try it, let me know!